(Since this proposition has caused quite a response, both proponent and detractor, I’m coming up with a proper academic writing to explain the position. The issue was raised not with a view to woo votes from Non-Muslim constituencies but if voters are attracted by our messaging and stance, so be it. We are surely pleased and encouraged. 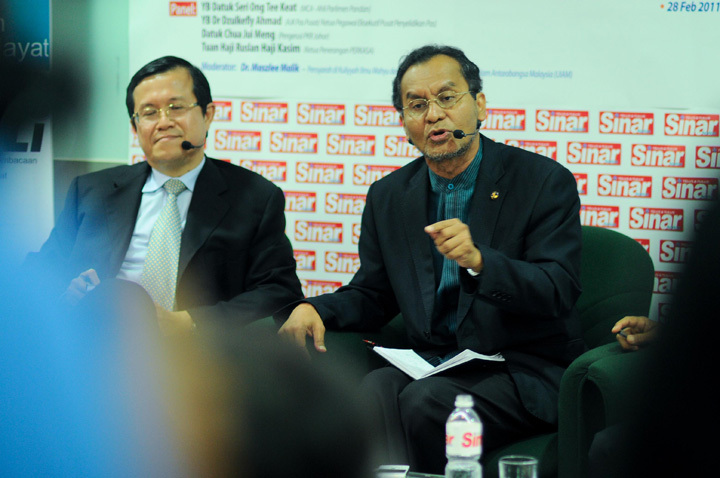 But it was not done with that in mind but more importantly to clarify our Islamic stance – to differentiate between the Fixed Principles of Islam (Al-Thawabit in matters of Faith and Morality) and those Principles that are to be contextualised (the Changeables – Mutaghayyiraat) in matters of government- governance etc Dr Dzul. SHAH ALAM, Feb 28 — PAS research chief Dzulkefly Ahmad said today the Islamic party is ready to accept non-Muslims in positions as high as deputy president. The Kuala Selangor MP said the party was ready to emulate Egypt’s Freedom and Justice Party (FJP), which appointed Coptic Christian intellectual Rafiq Habib as its vice president last year. The PAS central committee member had cited the Arab Spring, the wave of popular revolutions that began a year ago and toppled dictators in Egypt, Libya and Tunisia. The moderator Maszlee Malik then asked if PAS was ready to follow in the footsteps of the FJP, the political wing of the Muslim Brotherhood, who appointed Habib after Hosni Mubarak was forced to resign as Egyptian president. “Yes, we are ready. PAS is inclusive as seen with our Negara Berkebajikan and PAS for all concepts. We aim to be an active player in new politics,” Dzulkefly responded. The International Islamic University lecturer posed the question again during a press conference later, asking if PAS would accept a non-Muslim deputy president. Dzulkefly replied that the matter can be discussed if it is proposed. “This is only an administrative matter. We cannot say it will never happen because Islam can address change for intellectual renewal. Islam can withstand the challenge of time,” he said. Allegations that Christians are trying to convert Muslims peaked last August when the Selangor Islamic Religious Department (Jais) raided the Damansara Utama Methodist Church (DUMC) in Petaling Jaya. This came after repeated disputes between church and mosque, such as the legal battle over the the use of the word Allah to refer to the Christian god. An initial court ruling allowing the Catholic Church to use the term Allah had led to places of worship being firebombed in January 2010. The government also buckled under pressure and ordered the release of Malay-language bibles seized before Sarawakians, half of whom are Christians, voted in the April 16, 2011 state polls. Before the Jais raid, Umno’s Utusan Malaysia and Malay rights lobby Perkasa accused the DAP of conspiring to turn Malaysia into a Christian state. Although DUMC has denied Jais’ claims, Utusan Malaysia fanned the flames with allegations that Christian groups in Kuala Lumpur and Johor were actively trying to convert Muslims. Now you know why I am more than willing to vote for PAS and kick out that Chua of MCA if I got half the chance. Chua Soi Lek of MCA is a worthless apple polisher. PAS is ready to evolve with the times. all your party leaders say only a muslim can be pas senior leader. so what say u now? surely u cannot just make any statements to get votes (whatever u might call it under) but without thinking of what others in the party say? and not when your party constitution is saying otherwise.